I call upon Governor Ralph Northam to resign. This is a painful call for me. I genuinely like Ralph and Pam. And I do not for a moment believe he is racist today. But I have no doubt he was racist 35 years ago. There is no excuse for wearing black face or a KKK hood. None. Particularly not at age 25 in 1984. I'm still shocked and surprised and deeply disappointed. Northam must have known that picture was there, and I'm frankly surprised he ran for office in the first place. I do believe in forgiveness. I do understand that racism is endemic and systemic throughout the United States. And I understand that people who were racist do change, grow, and evolve. And we need to encourage that evolution. I sincerely believe Ralph Northam today is a good man and that he is not the racist he was at age 25. I think he will continue to do good things in his life. But when you lead a state, you have to follow a higher standard. We expect and have every right to demand a higher standard from those who lead us. 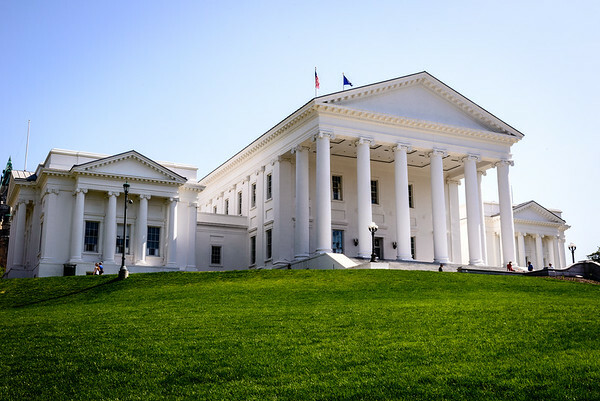 On this, the 400th Anniversary of Virginia's legislative assembly -- in a Commonwealth with four centuries of slavery, lynching, Jim Crow, and continued virulent racism -- we cannot have a Governor lead us with this past. I think Justin Fairfax will make a good Governor and pledge my support to him. Governor Ralph Northam at his press conference yesterday. 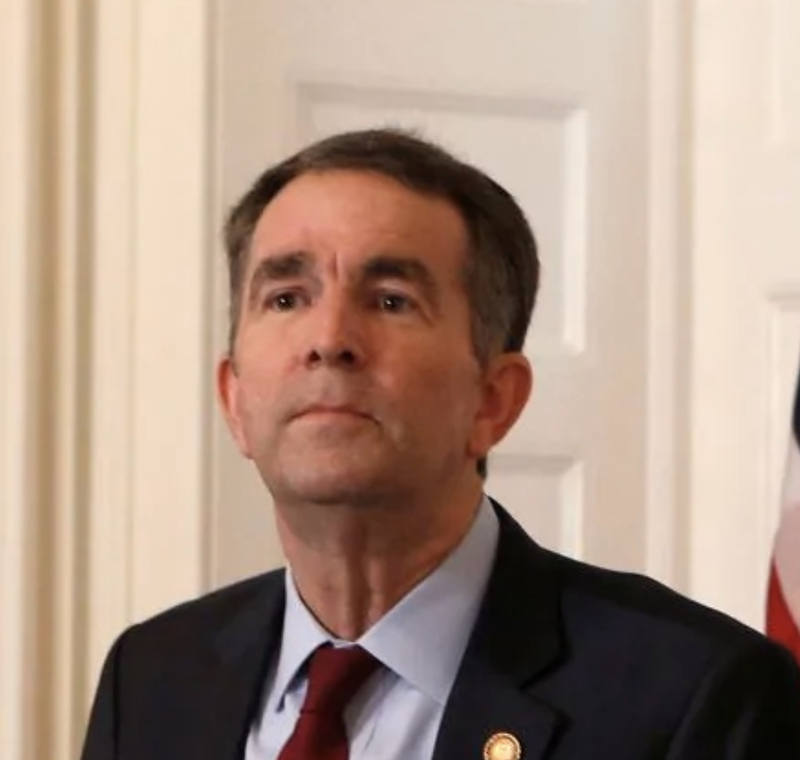 Having said he was in the photo on Friday, I was stunned when Governor Northam denied being in the photo on Saturday. At a press conference Saturday (yesterday), Governor Northam said he had never seen the photo before, had never seen the yearbook before, and had no idea the photo was even there. He admitted to having donned blackface to play Michael Jackson in a dance contest but insisted that he had never worn blackface at any other time and had never wore a KKK robe either. But why then did he claim he did so only the day before? I repeat what I said above. I genuinely like Ralph Northam. I do not believe him to be a racist today. I think he's overall been a good Governor, both with successes like Medicaid Expansion and his sincere work to reduce racial injustice. This whole episode is very painful. And if Ralph Northam had said on Friday what he said on Saturday, he might well have averted the call for resignation. That is, if the unusual nickname of "Coonman" (which he had no real explanation for) was not also in his VMI yearbook. What was that about? What Northam said Saturday may well be true. But at this point, how can he possibly lead Virginia? How can he possibly have put out a statement on Friday apologizing for appearing in a picture he was never in? And even if he wasn't in the picture, he must have thought on Friday it at least could have been him in the photo. Right? How can Virginians have confidence in a Governor who can't get his story straight? 1) Blackface is always wrong and never ok.
2) If you've made a mistake in your past, own up to it and tell the truth immediately with all the sordid details. Explain how and why you've changed. Be sincere. Don't hedge. 3) But (ironically) don't jump the gun so quickly that you fail to get the basic details right. Better to be a bit slower -- even as you're being pilloried for being slow -- to be absolutely certain that what you say is true. If you don't know something, say you don't know. Don't guess. The Governor's resignation will help Virginia heal, but we're not done. We proudly celebrate 400 years of the House of Delegates this year -- the oldest representative assembly in the New World we tell ourselves -- as many Virginians proudly pat ourselves on the back. But who did it represent? Not the Africans, who also arrived on our shores and would eventually become slaves. And certainly not the Native Americans who lived here for millennia before Europeans came to these shores, took their land, and then systematically expelled or murdered them. And the pain of blackface is much, much deeper. Where do you think the song "Dixie" or the name "Jim Crow" came from? These long-time "honored" American traditions came from minstrel shows, which were very popular in America from 1850-1950 (and in some places, well into the 1980's). Minstrel shows were very profitable for white people. But for blacks, minstrel shows literally added insult to injury. Already denied freedom as slaves and the right to vote in the Jim Crow era, prevented from getting good jobs, and segregated out of housing, hotels, and even water fountains, can you imagine the pain of being mocked as well? Cruelly portrayed as dumb at the same time you were denied the right to get a decent education? We need leaders in Virginia who understand this pain viscerally. You don't have to be a minority to "get it." But you have to "get it." And even more important than symbols, we need to recognize the systemic racism in our policies....in impoverished workers, arrests for "driving while black," mass incarceration, voter suppression, continued segregation, underfunded public schools, racist attitudes and presuppositions, and mistreatment of immigrants and refugees. As to the last point, can you imagine being separated from your children and then mocked as well for coming here to seek a better life? By descendants of people who did the same thing? Well then, what about our President? I call on Donald Trump to resign as well. I have no doubt that Donald Trump today (and throughout his life) is far more racist than Ralph Northam ever was. Unfortunately, I don't expect the President to heed my call. I'm hoping the Governor will. I don't know whether Ralph Northam could have survived as a Republican Governor or not. But he's a Democrat. He should resign. Simply put, we must hold ourselves to a higher standard. It's who we are. It's why we're Democrats. We are no longer the Democratic Party of Jim Crow. We are the party that proudly works to ensure liberty, justice, and equal rights and equal opportunities for all Americans. I believe everyone, regardless of income level, race, gender identity, zip code, or citizenship status should have the ability to choose how and when to start a family on their own terms. That's why I support a woman's right to choose whether or not to have an abortion. And it's why I copatroned Delegate Kathy Tran's HB 2491 to protect women's constitutional rights under Roe v. Wade by removing artificial and medically unnecessary barriers to abortion. 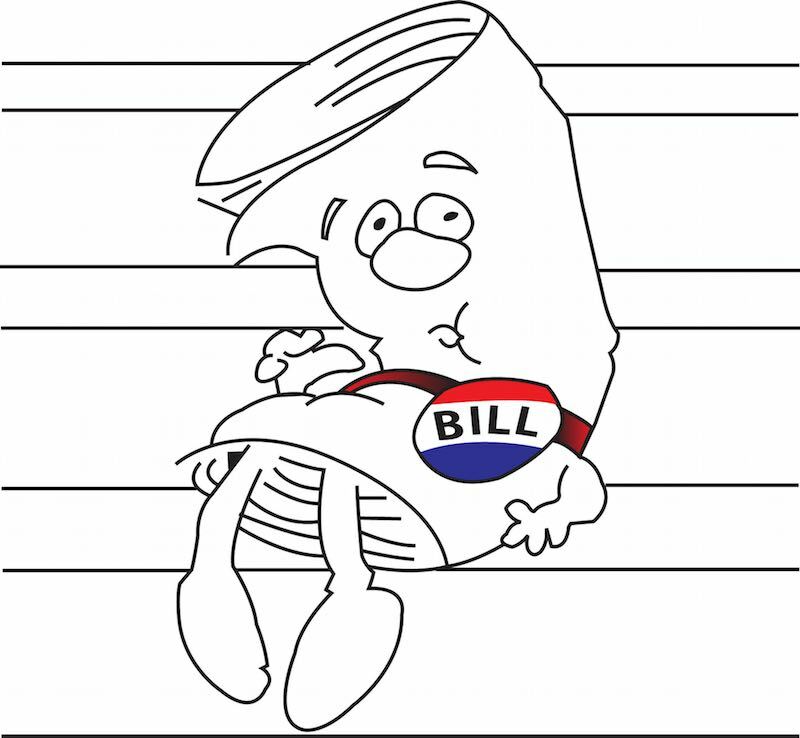 Every year, I copatron about 200 bills (in addition to introducing 15-35 of my own), and while I can't claim that every last detail of every bill I copatron is exactly the way I would have drafted the legislation myself, I generally copatron a bill if it's in the general direction of what I would like to see enacted into law. The vast majority of bills we pass are amended before they become law. So if a bill gets by committee, I have an opportunity to improve and put the final imprint on a bill before voting on it. As Tran's bill was killed on a party-line vote in subcommittee, I didn't have an opportunity to improve it. But I agreed with virtually all of it. You may have heard about this bill. Tran's bill has been mischaracterized nationally by anti-abortion opponents who believe that a woman, as a baby-making machine, should have no right to make her own reproductive choices. In effect, they insist that a woman's womb belongs more to the man who impregnated her, or to the fetus, or to politicians -- than it does to herself. We will have to agree to disagree. I believe a person's body has to belong first and foremost to the person with the body. It's your body. As long as you're not causing grievous harm to yourself, you should decide what you get to do with it. You should not have Richmond lawmakers intervening in intimate health care decisions made between you and your doctor. Critics focused on the small part of the bill dealing with late-term abortions, that extremely rare procedure used by a woman or doctor to have an abortion when her life or health is in serious danger or when the fetus itself is "non-viable", e.g. it will die within a few hours or days outside the womb. The bill reduces the amount of physicians necessary to authorize this rare but often life-saving procedure from three to one. And that seems right to me. You don't want a pregnant woman dying in an isolated rural community because she can't find a third OB-GYN at 2 am in the morning! The bill also did a lot of very good things. It would no longer require Virginia women to make two trips to a clinic to get a simple procedure. And the bill would no longer require Virginia women to undergo a state-mandated but medically unnecessary ultrasound. I've never understood why abortion opponents want to force women to undergo unnecessary and expensive medical procedures. Are they hoping that the cost will be prohibitive so that a very poor woman will have to bear an unwanted child? Do they think that poverty is easy for a woman and her newborn? Don't they understand that the best way to reduce the number of abortions is to reduce poverty so that women will have the economic ability to raise their children? Basically the bill was saying we trust Virginia women and their doctors to make this private and important decision for themselves. The Republicans who killed the bill made clear they did not trust Virginia women. 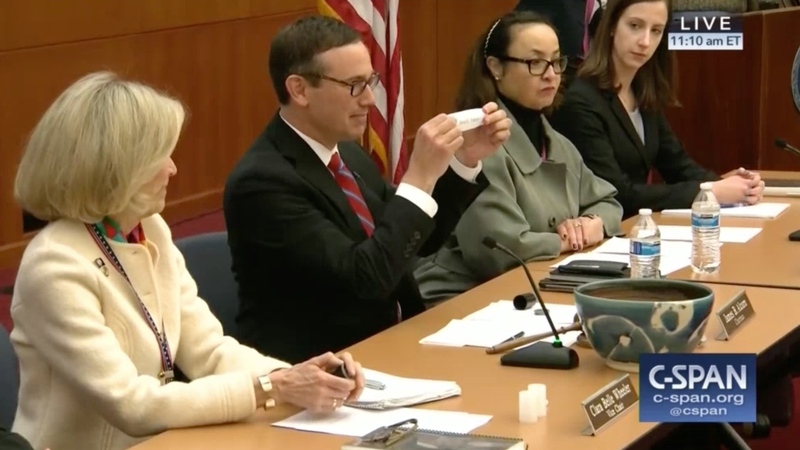 They argued that Virginia women might choose to carry healthy fetuses all the way to birth and then, after nine months of pregnancy, change their mind on a whim and be itching to commit infanticide just as a baby emerges from the womb. And they argued that, in such a circumstance, many a Virginia physician would cavalierly agree to killing a healthy child coming out of a healthy mother, despite Virginia law which already prohibits this (and which Tran's bill wouldn't change). The hypothetical scenario is ridiculous, of course. What woman would do this? What doctor would do this? There have only been two third trimester abortions in Virginia in the last 20 years, and both were dire emergencies. The real question is who should make the decision as to whether a mother lives or dies at a critical life-threatening moment. Should it be the woman and her doctor on a case by case basis with full medical knowledge? Or a bunch of politicians in Richmond guessing what the right result should be? I trust Virginia women and their doctors to make the right call. Some might ask why keep it legal for a pregnant woman to have a third-trimester abortion if it poses no "substantial and irremediable" physical danger to her life or health? So what if a woman needs stitches or medication or undergoes substantial pain or unnecessary surgery? That's not substantial and irremediable. If she must suffer to save the fetus, make her suffer! Choose life! Good rhetoric perhaps. But I ask you to look at the reality of late-term abortions. I ask you, for a moment, to put yourself in the shoes of my friends, Jim and Elizabeth. (I've known Jim for almost twenty years.) When Liz was 20-something in the 1970's, she was pregnant with a fetus with the congenital disorder trisomy 13. The baby was born with no functioning brain and missing several vital organs including no kidneys or functioning digestive or nervous system. The doctors said it would not live more than a few days because it was unable to digest food. Attempts to feed the infant caused it wracking pain and were entirely ineffective. But starving caused the infant pain as well. During those days, the infant slowly, painfully starved to death. The baby lived seven days in constant wrenching pain. You can imagine the turmoil for Liz and Jim as they watched their child die a slow, torturous death, right after Liz herself went through the pain and discomfort of a difficult childbirth. Worst of all, as they didn't have insurance, the hospital charged the young couple more than $250,000 for the baby's one-week life, an extremely large sum of money today and a veritable fortune 40 years ago (about $1.5 million today). This baby's short and horrible life literally bankrupted its parents. Liz and Jim had to start financially all over again as well. Elizabeth and Jim have said for decades afterward that had they known in advance about the consequences, they would have aborted the pregnancy late-term (as the genetic abnormality often doesn't exhibit itself until late in a pregnancy). And if they had made that choice, would you have blamed them? Should Virginia continue to make such a family's choice illegal? Would any anti-abortion proponents agree to give up their own entire family nest-egg to make sure another baby lives a few excruciatingly painful days before its unpreventable demise? And even if some abortion opponents would agree to give up all their wealth for this, wouldn't these millions of dollars be better spent on feeding and educating the tens of millions of children living in poverty in America, rather than continuing the pain and suffering of a terminal infant for a few days? In legislating, as important as it is to write and advocate for important new laws, it is equally vital — if far less glamorous — to carefully examine legislation to find concealed flaws, bring those flaws to light, and ultimately block bills that would harm the people of Virginia. In my four years of service here, I have often played the informal role of "Caucus Goalie." This week, I caught in my net HB2542, Republican Delegate Kathy Byron's bill to make it easier for parents to ship their kids off to unlicensed child-care facilities. This bill, which 41 of us opposed last year and was killed in the Senate after we raised red flags, was flying this year through committee uncontested. It made it to the morning of Third Reading and Final House Vote with not a single Democrat voting against it in committee or even noticing that more than 80% of our caucus opposed the legislation last year. At the last minute, I flagged the bill and moved it to the regular calendar. In doing so, we managed to quickly put up enough no votes (27) to make sure the bill gets the extra scrutiny it deserves. Passing the House is not the end of the line for a bill, and sometimes slowing down and drawing attention to a bad bill early in the process can be just as effective as killing it entirely. In last week's newsletter, I explained why I questioned Delegate Pogge on her bill HB2253 to make it easier for people outside of Virginia to quickly get a Virginia concealed-carry permit online without having to know anything about guns. Click above to watch our exchange if you haven't already. This week we voted on Delegate Pogge's bill on the House Floor. And by a narrow 50-49 vote, we actually defeated the bill! For a time at least. Then Republican Delegate Ransone changed her vote, allowing it to pass. But as with HB2542 above, I don't have to completely defeat bad bills in the House. I just have to draw attention to them, so they can be defeated in the Senate or vetoed by the Governor. Legislating is a team sport. Republican Delegate Tim Hugo's HB2529 aims to take the Trump Tax Increases on Virginia's poor and middle class and give those proceeds to Virginia's richest taxpayers. As Delegate Vivian Watts showed with her charts in the House Floor debate on Friday, 40% of the Trump Tax Increase is borne by Virginians earning under $50,000 a year. But they would get only 15% of the proceeds under Hugo's reverse Robin Hood bill. One small change in text, but one giant leap (backwards) for Virginians! Delegate Vivian Watts also has some very good Goalie skills. Nice catch, Vivian! millions of dollars in welfare giveaways to transnational corporate tax shelters. Last week, Senator Emmett Hanger's constitutional amendment to change Virginia's process for redistricting, SJ274 (the OneVirginia2021 plan), failed to pass in the Senate. But Senator George Barker's version, SJ306, passed the Senate unanimously. The amendment has been referred to the House Privileges and Elections committee. 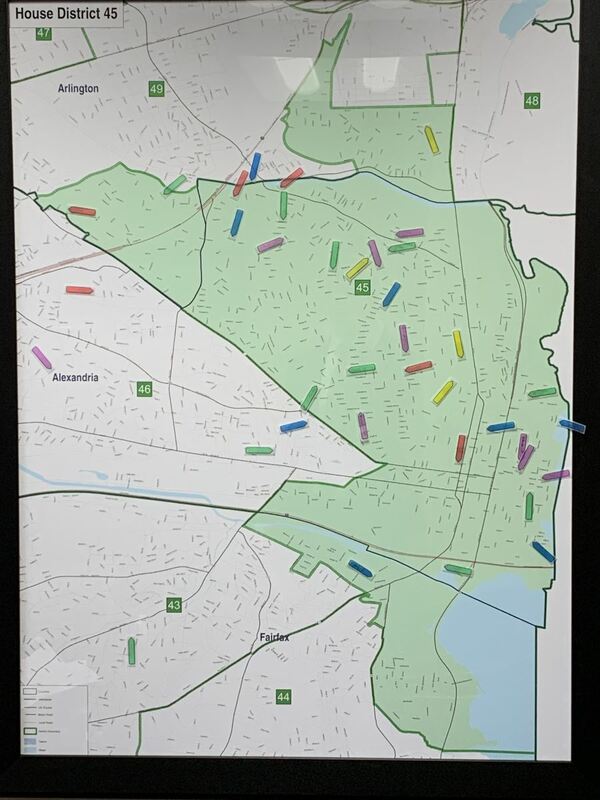 Senator Barker's amendment creates the Virginia Redistricting Commission, a 16-member Commission tasked with establishing districts for the United States House of Representatives and for the Senate and the House of Delegates of the General Assembly. The Commission consists of a bipartisan group of eight legislative members and eight citizen members. This amendment may be further amended if it gets to the House floor, and I will read it carefully before voting on it. I strongly support a constitutional amendment to set up independent redistricting in a way that makes Virginia districts accurately reflect Virginia's polity. We need to permanently end gerrymandering in Virginia. Three of my bills this week have passed subcommittee and full committee. Two of them should be heard on the House Floor Monday and voted on Tuesday (the last day before Crossover). One has passed the Senate. All of them protect vulnerable people: victims of domestic abuse and people of all ages who contract infections and diseases in health-care facilities. HB2642 would make it a felony to use cruelty toward animals to coerce, intimidate, or harass a household or family member. The bill passed through a Courts of Justice Subcommittee uncontested and out of the full Courts of Justice Committee last week. 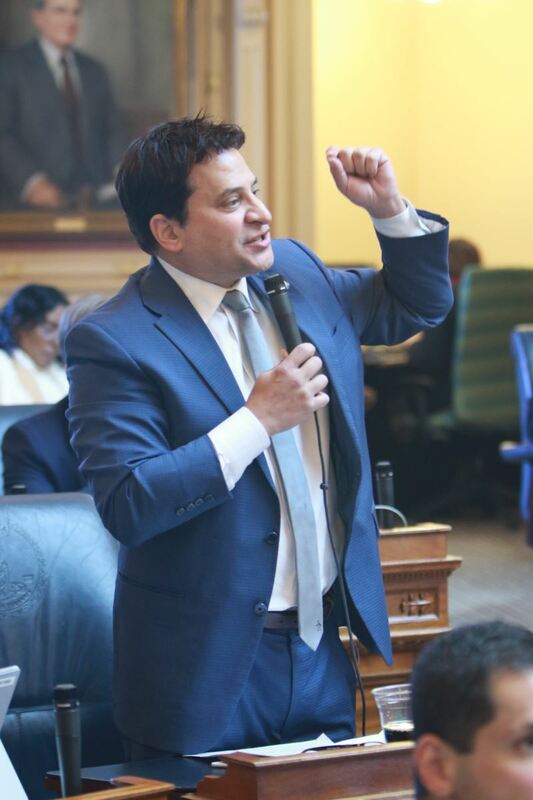 It will go to a vote on the Floor of the House of Delegates during Tuesday's "votearama." Click on the image above to watch my presentation of HB2642. HB2650 Tyler's Law, a bill I named after Tyler Strong, a Virginia boy who suffered horrific abuse after a court ignored horrific evidence of domestic violence and child abuse to give his father custody over him, originally passed through a Courts of Justice Subcommittee on Monday afternoon by a 3-2 vote. Many of you know and remember this bill, as it is one of only two that I have introduced every Session that I've served in the House. Virginia Law only currently protects children from violence occurring to family members or in the household. Tyler's Law would have allowed courts to consider any domestic violence or child abuse committed by parents in determining the best interests of children in custody disputes. I don't believe someone who beats an intimate partner or a child outside the household should be able to exclude that evidence from a trial determining who is the better parent. This bill came partly out of my own personal experience, when a Tennessee court found that the murder of my sister was not child abuse because she was not murdered in front of her children. That searing experience led me to draft my first law in Tennessee 20 years ago and was a big reason I sought elective office. I continue to insist domestic violence is child abuse. I don't think placing kids with parents who assault their intimate partners is usually in their best interest. This has been a long, on-going four-year fight with the Virginia Family Law Bar who, for years, have steadfastly refused to hold perpetrators of domestic violence and child abuse to account. After all, abusers often have a lot more money to pay lawyers than their victims do, and their lobbyists were determined to kill my bill. Even the Virginia Poverty Law Center and the Alliance Against Domestic Violence sadly acquiesced to the wishes of this powerful, well-financed group of lawyers. Once supporters of my legislation, these latter two groups backed off in the face of maximum pressure. I had tried all year long to work with them to draft the bill, and the bill I presented was drafted with their concerns in mind and originally met their approval. I firmly believe that groups looking out for victims of domestic violence should support legal efforts to help survivors, rather than work to undermine the very people they are ostensibly trying to help. So it was an uphill battle. And even though I prevailed originally in Subcommittee, the groups persuaded the Courts Chairman to send the bill back to the same Subcommittee with instructions to kill it. when it passed the Subcommittee the first time. the Courts Chairman ordered members to kill the bill. But I do have some good news on this bill. Although I could not convince the leaders of the Virginia Family Law Bar to take domestic violence seriously, they did finally, after years of resistance, agree with me that someone guilty of child abuse is probably not a good parent. I talked with Senator Scott Surovell about introducing my bill on the Senate side with only child abuse mentioned and not domestic violence. He did so. And the bill (SB1757) has so far cleared the Senate. It will come to the House after Crossover. Although I continue to insist that courts look at both domestic violence and child abuse when determining the best interests of children in custody disputes, I will be satisfied this year if only half my goal (protecting against child abuse) succeeds. 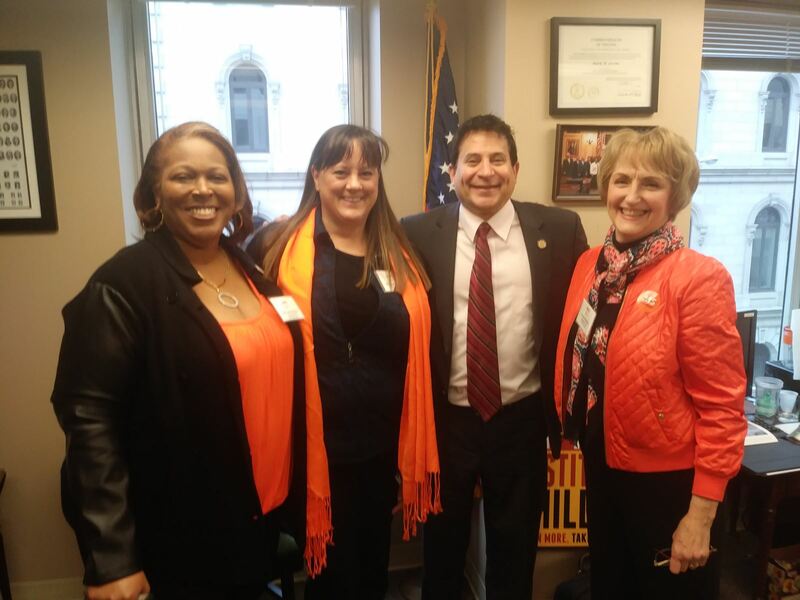 And then I will come back next year to fight to protect children from perpetrators of domestic violence. The same day the bill passed the Senate, I expressed my frustrations on the House Floor. Republican Glenn Davis had a bill that was sailing through on the uncontested calendar to let parents have equal time with their kids. I spoke against it to make the point that until we protect children from domestic violence and child abuse, we cannot blithely assume that they should spend equal time with both parents. Click on the image above to watch me challenge Glenn Davis on the Floor. We should not place children with dangerous parents. HB2695 would have provided court victims-services to those seeking a protective order and other victims of domestic violence and similar misdemeanor crimes. I presented the bill before a Courts of Justice Subcommittee on Monday. They agreed with me in principle but felt that a professional committee should examine the bill between the 2019 and 2020 sessions to determine exactly which classes of victims should be included. So they tabled the bill with a letter from the Chairman to convene this study with a goal toward passing the bill in 2020. Click on the image above to watch my presentation of HB2695. In the last two newsletters, I told you about HB2430, my bill to allow Alzheimer's and other mentally incapacitated people to have visits from family members and other loved ones, unless good cause is shown to prevent these visits. The bill would have prevented abusive guardians from withholding family contact for financial gain. And if you missed reading the details about this bill last week, please be aware that I keep all of my newsletters on my website at MarkforDelegate.com so I invite you to go there and take a look at last week's newsletter. The bill originally passed a Courts of Justice Subcommittee by a vote of 5-1. You can see last week's HB2430 presentation — when it passed the Subcommittee. When a bill passes through a Subcommittee, it is normally sent for a presentation, discussion, and vote in the full Committee. But instead, HB2430 was sent back to the Subcommittee last week. Lawyers for guardians — who make millions exploiting the incapacitated they're tasked with protecting — targeted the Subcommittee members, argued against the Uniform National Standards for protecting their wards, and got members to flip their votes. Click on the image above to see the 40-minute second round of HB2430 in Subcommittee. On the bright side, they did promise to work with me next year and were sternly warned of consequences if they did not. I'll let you know if they keep their promise. I concede I did not think the Republicans on the Elections Subcommittee would agree to remove from the Virginia Code the "dirty trick" they used in 2017 to un-elect would-be Democratic Delegate Shelly Simonds who had won her race by one vote. But I do think I made a good case for the change. After all, until the Code is fixed, we Democrats can use the same dirty trick they used last election. And we won't be surprised next time. HB2757 — The "Protect Shelly Simonds Bill" — would have clarified in recount procedures that no candidate from either party should be able to game the system and unseal previously sealed boxes during a recount to "find" more votes. If this bill had become law, it would have made clear that any concerns someone has with a vote must be addressed at the time the vote is recounted and not at a later time when it might serve some candidate politically. I started my presentation of this bill at 7:28am on Thursday morning. And by 7:34, after just two questions, it was dead. Don't believe me? Watch the clock on the wall in the background of the video below! Click on the image above to watch my presentation of HB2757. In my first two years in office, Republicans had a 66-34 majority and Bill Howell was Speaker. Many of my bills died those first two years, but at least they were all heard by at least one subcommittee. I guess Speaker Howell knew that if a decent progressive bill escaped subcommittee, Republicans could always kill it on the House Floor. 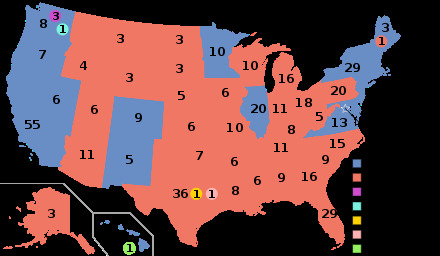 HB2422 would have changed our national system of electing the President of the United States from the Electoral College to the National Popular Vote. It would have entered Virginia into an interstate compact and not require a Constitutional Amendment. I expected the bill to be killed on a party-line vote by the Republican-led Privileges & Elections Subcommittee. I was wrong. Instead, no subcommittee even heard the bill. The Privileges & Elections Subcommittee to which it was assigned "ran out of time" in its final meeting prior to Crossover. And the Chairman refused to schedule a new meeting to hear it. 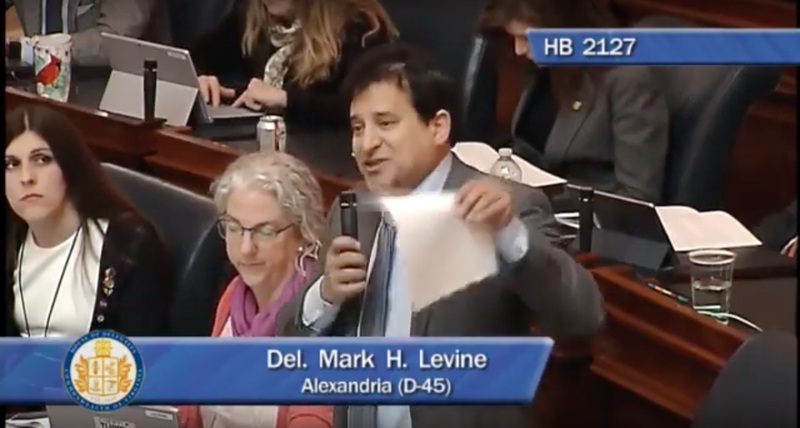 HB2421 would have comprehensively banned discrimination on the basis of sexual orientation and gender identity in employment, housing, public accommodations, banking, insurance, apprenticeships, and every other place I could find in the Code of Virginia. Although I introduced it prior to the first day of session, the bill -- along with other Rainbow-rights bills -- was sent to languish in the Rules Committee. The Rules Committee does not have scheduled meeting times but rather meets "at the call of the Speaker." On Sunday evening I learned that HB2421 had been added to the Rules Committee agenda — for Monday afternoon! Then, instead of actually hearing the bill, the Rules Committee referred the bill to the General Laws Committee, bouncing it around at the last second like a hot potato to prevent the bill from actually being heard. It was never added to either of the General Laws Committee agendas this week, and the bill died without ever once forcing a Republican delegate to vote on the bill. This was a new tactic by Republicans: to ensure bigotry will be protected without ever having voted on the issue. 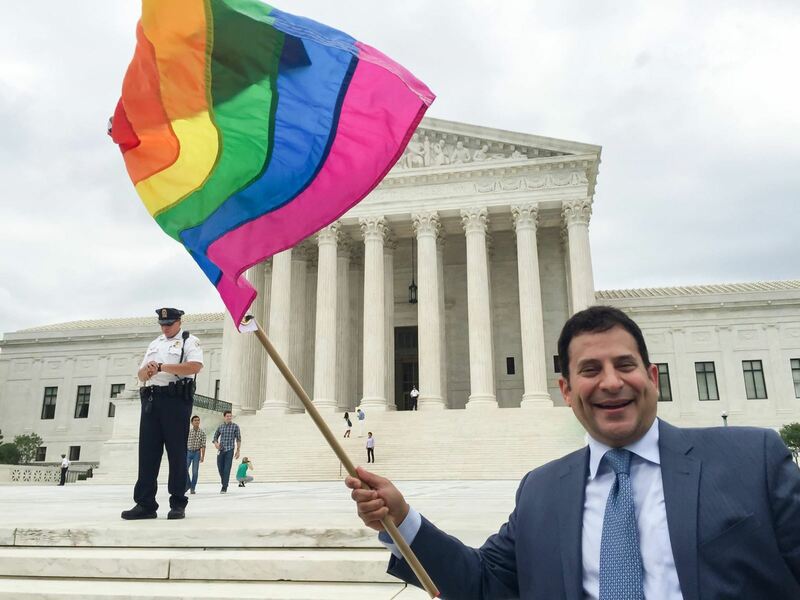 At an event for Equality Virginia, advocates gleefully bragged that they had two Republican votes on General Laws, which was supposedly enough (with all Democrats) to get LGBT-rights bills to the House Floor where they would pass the Senate and become law. But because no House Republicans actually support Rainbow rights enough to force a vote on them on the Floor, the Republican Leadership just made sure the bills would never be heard at all in any committee, even though a majority in both House and Senate and in the important committees said they believed in equality under the law. Virginians will never be given equality under the law as long as Republicans remain in control of the Virginia Legislature. It really doesn't matter how many Republican delegates and senators say they care about non-discrimination. Their most important gay-rights vote is for Speaker of the House and Majority Leader in the Senate. And every Republican, by this vote, defends anti-gay, anti-trans bigotry. Really, Equality Virginia should stop wasting their time and pretending that courting Republicans has any value at all. The only way forward for LGBT equality is Mission 51 (two more Democrats in the House) and Mission 21 (two more in the Senate). on the day we finally achieved Marriage Equality nationwide. And to prove that, I plan to re-introduce again this year my budget amendment on the House Floor that would simply reiterate that we agree with the Governor's ban on discrimination in Virginia jobs. 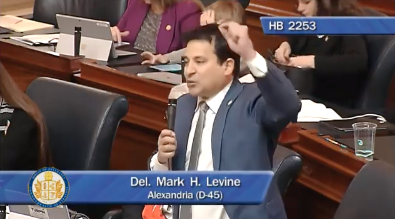 I predict that all the Republicans who pretended to care about LGBT rights in talks with Equality Virginia and in their moderate districts will flip flop to support bigotry by opposing my amendment on the Floor. Anyone want to take my bet? Friends Don't Let Self-Respecting Rainbow Friends Vote Republican. Just Two Days Until Crossover! 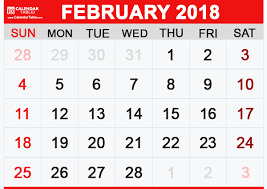 Friday, February 1 was the last day for bills to get through Committee. Tomorrow (Monday, February 4) is the longest day of the year. Not measured in sunlight, of course, but in time in the House Chamber! It's the longest day of the year for all Virginia legislators. This is the final day to discuss and debate bills introduced by a Member of the House of Delegates in 2019. Beginning with caucus at 8 am, we won't finish until well after dark. Then Tuesday, February 5 is Votearama Day. We will vote on literally hundreds of bills. By midnight, February 5, every bill that does not pass the House of Delegates dies. Then, the rest of the week, from February 6 to February 8, we will consider the budget. And then the last two weeks, we will focus on bills that passed the Senate. Our last day of session is Saturday, February 24. In Session, every day seems like a week. A week seems like a month. And a month seems like a year. We're half done now. And it seems like we began ages ago. At the last Health, Welfare, and Institutions Committee before Crossover. I'm not sure why I'm smiling. Maybe because my HB 2425 passed during this meeting. 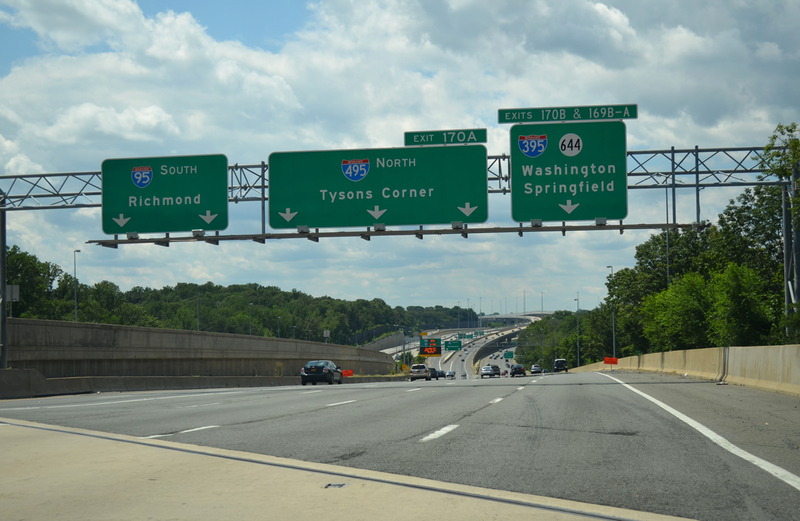 On Tuesday, I joined fellow legislators in announcing more than $1 billion to fund four projects that will reduce congestion and improve connectivity on I-495 in I-95. Thank you to the 70-odd people who got up early on Saturday morning to come to a town hall I co-hosted with Senator Adam Ebbin last weekend. And thank you to Virginia Public Radio Reporter (and author and journalist) Michael Pope for facilitating the discussion. 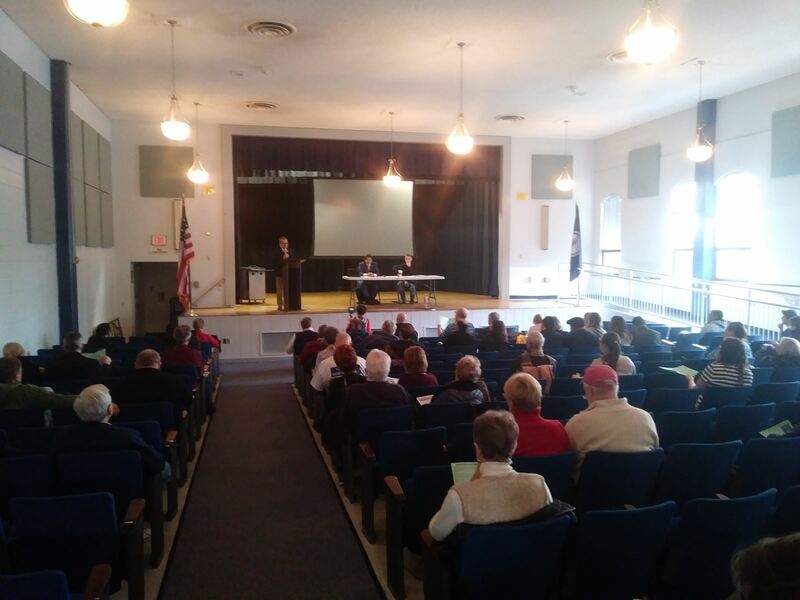 Questions on redistricting and Amazon were the most prevalent ones asked, but we discussed a wide variety of topics from the environment to transportation to guns to the "speed round" to how bills pass -- or fail to pass -- in Richmond. After we pass Crossover, the busiest time of the year for me will be over. While I'll still have plenty of meetings and Committees to attend, I'll have far fewer of those than I've had since the start of the year. What that means is that I'll have plenty more time for visitors. 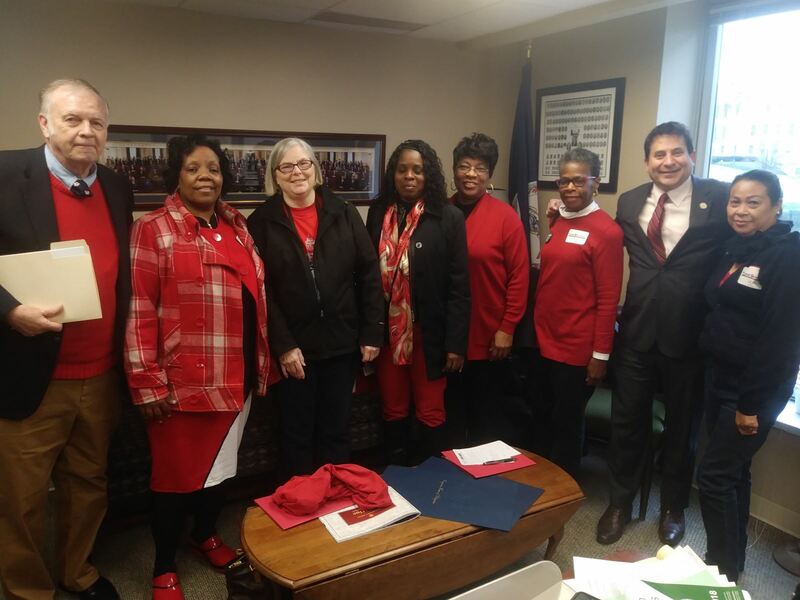 Got a visit from the Arlington Education Association on "Wear Red 4 Ed(ucation)" Monday! The Arc of Northern Virginia does great work helping Virginians with disabilities.